The Advisory subcommittee on planning and regulation met at 7:00 pm Tuesday, March 30, in the first-floor south meeting room at Town Hall. There was a large turnout for an Advisory subcommittee, 25 members of the public and two town staff: Alison Steinfeld, the planning director, and Jean Innamorati, a planning consultant and former Brookline preservation planner. The topic was Article 11 for the annual town meeting starting May 26: a Crowninshield local historic district. Four of the five subcommittee members were on hand: Stanley Spiegel of Precinct 2, the new chair, Angela Hyatt of Precinct 5, Steven Kanes, not a town meeting member, and Lee Selwyn of Precinct 13. Although submitted by the Preservation Commission, the article represents a neighborhood initiative. Dr. Spiegel called on John Sherman, a resident of Adams St. Stimulus for preservation: Mr. Sherman explained, to no one’s surprise, that while a local historic district for the Crowninshield neighborhood had been talked about for years, the stimulus leading to action was an application late last year to demolish the house at 21 Crowninshield Rd., followed by stories that the new owners wanted to build multifamily housing, despite single-family zoning. The map for the proposed local historic district includes all houses fronting on Crowninshield Rd. and on Adams, Elba and Copley Sts. except multifamily housing recently built over the former St. Aidan’s Church parking lot, at the corner of Crowninshield Rd. and Pleasant St.
Background: Ms. Innamorati and David King, chair of the Preservation Commission, described the historical background of the neighborhood. Once part of the large Sears estate, by mid-nineteenth century the area was owned by the Crowninshield family. In 1899, after the death of the last immediate family owner, it was subdivided into house lots. The current houses were designed by several architects and built between about 1900 and 1930. Except for the nineteenth-century Crowninshield mansion, the original houses in the district remain intact. Several of them feature the “craftsman style” that was new to the U.S. and popular in the early twentieth century. The scales and setbacks of most houses are similar, despite the variety of styles, designers and builders. Neighborhood support: Mr. Sherman said neighborhood organizers for the historic district had tried to contact every property owner in the proposed district by telephone, e-mail and first class mail and had found no opposition. There are 61 single-family and two 2-family houses. Residents from seven properties had not yet responded, he said, while of those responding all but the residents of three properties–that is, the residents of 53 properties–joined in a petition to establish the district. The residents not joining said they do not oppose the plan. Dr. Spiegel polled the audience and found no one opposed to the historic district. The developers proposing multifamily housing at 21 Crowninshield Rd. are a local group calling themselves “21 Crown” and including Robert W. Basile, a Precinct 14 town meeting member. Using powers under Chapter 40B of Massachusetts General Laws, they expect to override Brookline zoning. No one from that group came to the Advisory hearing. So far, the developers have not publicly opposed the historic district. Review: Subcommittee members asked about the effect of a local historic district on a Chapter 40B proposal. Ms. Steinfeld advised that the proposed district would not block such a development when it is considered by Brookline’s Zoning Board of Appeals. However, Kate Poverman, an Adams St. resident, said “town feedback suggests” the development was “not likely” to go ahead. Subcommittee member Angela Hyatt, a Precinct 5 town meeting member, said it was “hard to imagine a better case for a local historic district” (LHD). Lee Selwyn of Precinct 13 said “the LHD approach has become more and more important in Brookline.” He mentioned needs for “enough staff in the Planning Department…to enforce” historic district regulations. Dr. Spiegel recommended a renewed effort to contact residents in the seven properties not yet heard from. The subcommittee voted unanimously to recommend approval. This entry was posted in Development, History, Housing, Neighborhoods on March 31, 2015 by Craig Bolon. A regular meeting of the Board of Selectmen on Tuesday, March 24, started at 6:55 pm in the sixth-floor meeting room at Town Hall. 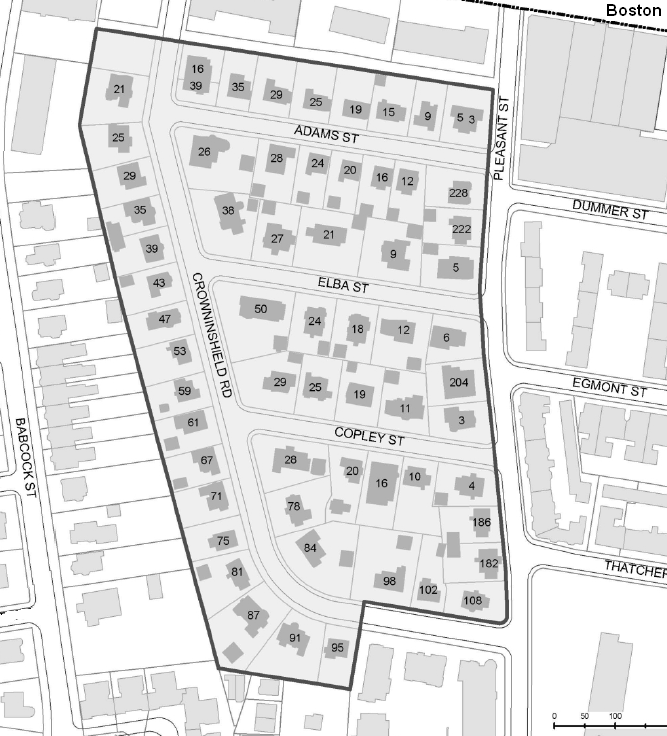 The board reviewed a partly subsidized housing development at 21 Crowninshield Rd., which proposes to use powers under Chapter 40B of Massachusetts General Laws to override the single-family zoning. Contracts, personnel and finances: Peter Ditto, the engineering director, described a report and request for reimbursement under the 2014 state-funded road program, authorized through Chapter 90 of the General Laws. Brookline is eligible for about $1.24 million; the board approved. Daniel O’Leary, the police chief, got approval to accept a $0.01 million state grant for a youth program. Alan Balsam, the health director, got approval to accept a $0.01 million state grant for a low-income nutrition program, cooperating with the Brookline Food Pantry. Mr. O’Leary also received approval to replace a traffic supervisor who is retiring. Dr. Balsam got approval to replace a program coordinator who is leaving to become assistant health director in Belmont. As to both, Ken Goldstein, the board’s chair, made his usual request to seek a diverse pool of candidates and consult with the personnel office and the diversity department. New 40B project: The board considered a recent proposal to develop partly subsidized housing at 21 Crowinshield Rd. in North Brookline. A response to a Mass. Housing agency application had apparently been drafted by Maria Morelli, recently hired as a planner, who as a consultant had coordinated the town’s professional efforts reviewing the proposed 40B project at Hancock Village. The developers are a local group calling themselves “21 Crown” and including Robert W. Basile, a Precinct 14 town meeting member. Last year they bought the single-family house at 21 Crowninshield Rd. and an adjacent, undeveloped lot to the north. Then they cut down almost all the trees and plantings that had grown over about a century, leaving the house isolated and exposing to Crowninshield Rd. residents a stark view of the back of the Arbour-HRI Hospital, on Babcock St. Instead of fireproof construction, the “21 Crown” developers are proposing a “4-decker” wood-frame building divided into 20 apartments with an elevator. Two are called “three bedroom” and the rest “one bedroom” units, but all would be fairly small–around a thousand square feet. The design recalls a “suburban hamster cage” concept that was previously seen in Cambridgeport starting in the 1960s. No representative for the developers appeared at this meeting of the Board of Selectmen. Ms. Morelli said comments from reviewers had called the proposal “inappropriate for the site.” Developers, she said, “tried to cast the context as Commonwealth Avenue business.” Mr. Basile owns nearby property along Commonwealth Avenue now housing Enterprise Rent-A-Car, Firestone and Sullivan Tire. Kate Poverman, a neighbor on Adams St., called attention to the large “concentration of affordable housing in our area” but said, “We’ll work with the developer.” Barbara Scotto, a member of the School Committee who lives diagonally opposite the site, described hazards, saying, “Traffic is already backed up frequently at Pleasant and Adams.” The board approved the response to be sent to Mass. Housing, with several revisions. Budget reviews: The board reviewed proposed budgets presented by Patrick J. Ward, the town clerk, for the town clerk’s office, by Mr. O’Leary for the Police Department and by Andrew Pappastergion, the public works commissioner, for the Department of Public Works. Mel Kleckner, the town administrator, has proposed defunding one patrolman position in the Police budget, currently vacant. Mr. O’Leary said the Police Department would continue to function without the position if necessary. The board reviewed two warrant articles for the spring town meeting: 4. Close-out of special appropriations and 12. Snow bylaw amendments. There are currently no special appropriations eligible for close-out. The bylaw changes had been drafted on behalf of the Board of Selectmen. They raise fines for failure to clear snow from sidewalks, specify new violations and fines, and eliminate a requirement to notify on a first offense instead of citing and fining. The public works commissioner would have increased discretion. This entry was posted in Business, Development, Neighborhoods, Regulations, Services, Taxes, Traffic on March 30, 2015 by Craig Bolon. The Advisory subcommittee on administration and finance met at 6:00 pm Thursday, March 26, in the fourth-floor conference room at Town Hall. Groucho, Chico and Harpo were away; Zeppo had left the troupe. New chair Leonard A. Weiss of Hawthorn Road, not a town meeting member, Clifford M. Brown of Precinct 14 and new member Dennis L. Doughty of Precinct 3 were on hand. Town Clerk Patrick J. Ward, whose budget comprised the 6:00 pm agenda, had gone missing. That did not seem to bother subcommittee members, who immediately advanced to the agenda advertised for 6:30 pm. They briskly dispatched four warrant articles for the spring town meeting: 1. Measurers of wood and bark, 4. Close-out of special appropriations, 5. Unpaid bills and 7. Budget amendments. Following town bylaws, Advisory subcommittee meetings are docketed as public hearings at specific starting times. Members of the public who might have wanted to comment would not get a chance unless they came early. Hobnobbing with mayors while stiffing selectmen: The subcommittee then turned to the budget for Board of Selectmen with Melissa Goff, the new deputy town administrator, and Item A: $10,000 to join the Massachusetts mayors club–even though Brookline is a town and has never elected a mayor. Town Administrator Mel Kleckner had opted to part with this luxury unless voters pass a tax override in May, but the subcommittee was not so disposed. A majority of subcommittee members seemed to have their own sense of priorities, and hobnobbing with mayors made the cut. They voted to recommend the $10,000–with or without a tax override–Mr. Doughty dissenting. Maybe compensating for such largesse, they voted to zero out stipends for the Board of Selectmen–with or without a tax override and without consulting them–Mr. Doughty again dissenting. Members of Brookline’s Board of Selectmen have historically received stipends for their work, dating from colonial times when they constituted the town government. This year the stipends are $4,500 per year for the chair and $3,500 for the other four members. Stipends have not kept up with inflation, going up $1,000 over the last 40 years. The subcommittee proposed to ax them once and for all, as an economy measure. The elected town officers “can be like the rest of us,” a member of the subcommittee remarked, in serving without pay. With Mr. Ward still missing in action, the subcommittee turned to more than $3 million in the “unclassified” budgets proposed for fiscal 2016: reserve fund, liability fund, stabilization fund, affordable housing fund, contingency fund, out-of-state travel, printing fund and Massachusetts Municipal Association dues. The last of these, often a substantial benefit to Brookline, is to cost $12,278–just a little more than the price for hobnobbing with mayors. The whole $3 million was waved on after about ten minutes. Summoning the clerk: With no more business at hand, Ms. Goff volunteered to search for the town clerk, whose office stays open Thursday evenings. She found Mr. Ward there. He began pleading ignorance, saying he had not yet caught up with Daylight Saving Time–which started March 8. Subcommittee members seemed unaware of unusual strains in his office during the past year. Mr. Ward did not enlighten them much, mentioning only that he lost an employee in the previous budget cycle. Willingly or not, he has had the traditional duties of Advisory Committee and Board of Appeals reporting yanked away. Advisory now has its own paid assistant, and Board of Appeals moved in 2014 to the Planning Department. As reported in the Brookline Beacon, during the past year one other employee was fired, and one quit to take a different town job. There has been more turnover in the office than in about the last 20 years. The subcommittee did not wish on Mr. Ward any added grief and will recommend his proposed budget. This entry was posted in Elections, History, Information, Meetings, Services on March 27, 2015 by Craig Bolon. A regular meeting of the Board of Selectmen on Tuesday, March 17, started at 6:45 pm in the sixth-floor meeting room at Town Hall. The board began reviews of budgets and warrant articles for the 2015 annual town meeting in May. They will continue at least through April. Contracts, personnel and finances: Alison Steinfeld, the planning director, got approval for a $0.01 million contract with Public Archaeology Laboratory of Pawtucket, RI, to complete a National Historic Register application for Hancock Village in south Brookline. If approved, Hancock Village would become the largest National Register site in Brookline. A National Register application for Hancock Village has been under discussion for several years. Last summer, board member Betsy DeWitt said it should become an urgent priority, at a hearing of the Zoning Board of Appeals about a proposed housing development under Chapter 40B of Massachusetts General Laws, which can override zoning. Lara Curtis Hayes, from the Department of Planning and Community Development, got authorization to apply for $0.25 million in state “green community” funding for energy-saving improvements. Most projects eligible are for town-owned buildings. Solar photovoltaic facilities and new vehicles are not eligible. Grant planning sounded murky at best. No description of Brookline’s projects had been released, yet the application deadline was only three days away. In response to a question from board member Nancy Daly, Ms. Steinfeld said that Brookline’s ongoing program of installing LED street lighting could be an eligible activity. Board members Neil Wishinsky and Betsy DeWitt did not seem to gave read information distributed in advance and asked about solar photovoltaics and new vehicles. Licenses and permits: Frank Shear of Framingham, former operator of Benny’s Crepes in Boston and Cambridge, applied for restaurant and entertainment licenses to operate Brick Wall Kitchen at 224 Cypress St., formerly Rita’s Cafe. Mr. Shear had operated the crepe cafe from a food truck. He said there were no plans to resume such a business and said that Brick Wall Kitchen will provide take-out service but not delivery. The board granted the licenses. Owners of Holiday Inn at 1200 Beacon St. got board approval for a change in manager under their alcoholic beverage license. Stephen Bowman, operator of Fairsted Kitchen at 1704 Beacon St., spoke on behalf of an application for longer operating hours, closing at 2 am instead of 1 am Mondays through Thursdays. Board member Nancy Daly asked about outdoor service. Mr. Bowman said there would be no late-night service outdoors. The board allowed the extensions of hours. Lisa and Daniel Wisel of Brookline, operators of Vine Ripe Grill at the Putterham Meadows public golf course, had applied for a seasonal license to serve alcoholic beverages, but neither was present at the meeting to support the application. Nevertheless, after waiting about 20 minutes, followed by cursory discussion, the board approved a license for the 2015 season. Warrant articles: The board voted to approve and publish a warrant with 20 articles for the annual town meeting to start Tuesday, May 26. About half are routine each year. Others have been submitted by boards or through petitions, which require signatures of ten or more registered voters. The board also began reviewing the warrant articles and the budget appropriations for fiscal 2016, under Article 8. Submitters usually include explanations for articles, published separately. At least two weeks before a town meeting, the Board of Selectmen and the Advisory Committee will distribute a combined report with the text and explanations of articles plus their recommendations to the town meeting. Warrant article reviews, including budget reviews, are docketed as public hearings; members of the public are invited to comment. Budget reviews: The board began reviewing so-called “base budgets” for fiscal 2016, starting in July. Prepared by Mel Kleckner, the town administrator, and his staff, those budgets apply if voters do not approve a tax override proposed at the May 5 town election. They include cuts to be restored if the override passes. The board reviewed a budget for the Fire Department as described by Paul Ford, the fire chief. Mr. Kleckner has proposed to defund one firefighter position, currently vacant. Ms. Daly asked how the department would cope. Mr. Ford said minimum manning requirements would lead to increased overtime, probably costing around a quarter of what would be spent on a full-time firefighter position. In his few years as fire chief, Mr. Ford has led an initiative in training, increasing the number of fire personnel certifications from around ten to nearly a hundred. In addition to the familiar emergency medical technician certificates, those include firefighting specialties such as rescue and chemical fires. Ten members of the department have also qualified as instructors, allowing them to train others without outside expenses. Sara Slymon, the library director, and Michael Burstein, who chairs the Board of Library Trustees, described a budget for town libraries. In that budget, Mr. Kleckner proposed to defund a part-time librarian. Ms. Slymon said there were no vacant positions, so that someone would have to be dismissed. She described library services as “dangerously understaffed,” down from 50 positions several years ago to 40 now, spread among the main library and the branch libraries at Coolidge Corner and Putterham Circle. Planning and Community Development: Ms. Steinfeld described a budget for the Department of Planning and Community Development. It now serves many standing boards, including the Planning Board, Preservation Commission, Neighborhood Conservation District Commission, Zoning Board of Appeals, Conservation Commission, Zoning Bylaw Committee, Economic Development Advisory Board, Housing Advisory Board, Community Development Block Grant Committee and Climate Action Committee. Fifty years ago, it served only the Planning Board, established in 1922. Bruce Genest of the Department of Planning and Community Development, who is president of AFSCME Local 1358, spoke about what he called a “staffing issue,” saying that in 2011 the department “eliminated a financial position.” Mr. Kleckner said the issue was “being litigated.” Mr. Genest said the town “took union work [and] distributed [it] to management people.” Otherwise, the background of the dispute was not clear. The board did not vote recommendations on any of the budgets. Included on its agenda was an application from Christopher Hussey, an architect, for reappointment to the Zoning Board of Appeals, but the board did not act on it. The Board of Selectmen is suing the Zoning Board of Appeals, seeking to overturn a comprehensive permit the latter recently granted for a partially subsidized, Chapter 40B development at Hancock Village. This entry was posted in Business, Development, Elections, Environment, Housing, Licensing, Meetings, Projects, Services, Taxes on March 20, 2015 by Craig Bolon. Years ago, long-time Advisory Committee member Harry Marks would tour the tables at the opening session of budget reviews. He would present men chairing subcommittees with tie clips and women with pins, in the shapes of scissors, reminding each one, “The purpose of the Advisory Committee…is to cut.” Mr. Marks imported scissors. Starting off this year, Advisory looks engaged in a role reversal. Increases have been proposed over budgets received from the town administrator and Board of Selectmen. On traditional St. Patrick’s Day, Tuesday, March 17, the full committee voted to add a firefighter position in the Fire budget. The next evening, its planning and regulation subcommittee voted to add 1.2 professional positions in the Planning budget. Submitting budgets: Budgets remain a committee responsibility that is not simply “advisory.” By law, the Advisory Committee submits a town budget to an annual town meeting. Oddly, Town Administrator Mel Kleckner appears to treat the committee as a functionary, sending Melissa Goff, the new deputy administrator, while he attends mainly meetings of the Board of Selectmen. This year, that might prove shortsighted. In a free-form discussion at the end of its Tuesday session, members of the committee considered how to “pay for the increases” through other budget maneuvers. Several members, sophisticated in municipal finance, offered a variety of options. Sean Lynn-Jones, the new committee chair elected that evening, and Carla Benka, the vice chair, said the committee would tackle the topic at its “omnibus” wrap-up session, once the individual budgets of agencies, departments and offices have been addressed. Preservation planning: The most volatile budget issue to emerge so far concerns preservation planning. Over more than 40 years, Brookline has grown and expanded several functions in this area, starting in nineteenth century with a voluntary, still vital Brookline Historical Society. It developed a Preservation Commission, regulating local historic districts and also serving as a state historical commission, a new Neighborhood Conservation District Commission, and related functions of a Conservation Commission, a Zoning Bylaw Committee and the Planning Board. In the table, “LHD” counts the number of property improvement cases in local historic districts, “Dem.” counts the number of demolition-delay cases and “NCD” counts neighborhood conservation district cases, which began last year. Since 2001, the workload appears to have more than doubled, while staff positions grew 35 percent. Advocacy: When the Board of Selectmen held a public hearing for the Planning budget on Tuesday, board member Betsy DeWitt and former Preservation chair Jim Batchelor, an architect, made an appeal for more preservation staff. Advocates appeared in force at the subcommittee hearing the next evening, with over 20 people from several parts of town. On Wednesday at the subcommittee, David King, current Preservation chair, argued that preservation cases have tended to become more complex over the years, needing more staff time per case. More of the demolition-delay cases involve historically significant structures. “The staff is overworked and exhausted,” he said. Many were aware that Dr. Hardwicke has been out recently with an illness and that Ms. Innamorati has resigned, coming in on special assignment about half-time. Judith Selwyn, a long-time Preservation Commission member, described lack of coordination between zoning and preservation planning. It has become a particularly acute problem, she said, with new neighborhood conservation districts, contributing to delays in a recent case on Perry St.
Barbara Scotto, a School Committee member and neighbor of Ms. Poverman, argued for three full-time preservation planners instead of the 1.8 positions proposed by the town administrator. She was joined by Dennis DeWitt, an architectural historian and member of the Preservation Commission, who recounted the types of work performed by the planners, and by Mr. King, Mr. Batchelor, Ms. Selwyn, Ms. Hogan and several others. On motions from Lee Selwyn and Angela Hyatt, the subcommittee agreed and is making that recommendation to the full committee. This entry was posted in Development, Environment, History, Housing, Meetings, Neighborhoods on March 19, 2015 by Craig Bolon. At the 5 pm filing deadline on March 17 for Brookline’s 2015 town elections, scheduled for Tuesday, May 5, contests emerged for Board of Selectmen and for School Committee–as well as for town meeting seats in six precincts. Candidates have until April 2 to withdraw their names. Board of Selectmen: Current members of the Board of Selectmen Ken Goldstein and Betsy DeWitt, whose terms are expiring, had announced they would not run for re-election and did not file nomination papers with the town clerk. Five new candidates filed: town meeting members Merelice of Precinct 6, Bernard Greene of Precinct 7, Nancy Heller of Precinct 8 and Pam Lodish of Precinct 14, and Larry Onie, a Marshall St. resident. Mr. Greene, Ms. Heller and Ms. Lodish were members of the Advisory Committee until they decided to run for Board of Selectmen and resigned, following policies set by the current moderator, Edward “Sandy” Gadsby, who is unopposed for re-election. Ms. Heller and Ms. Lodish are also former elected members of the School Committee. Mr. Onie was a member of the former Human Relations and Youth Resources Commission. Other town-wide: Current member of the School Committee Abigail Schoenbaum Cox, whose term is expiring, did not file nomination papers with the town clerk. Elizabeth Jackson Stram, a Powell St. resident, and Sandra L. Stotsky, a Clark Rd. resident, filed for School Committee. Ms. Stotsky has been a member of the Democratic Town Committee. Current School Committee members Pen-Hau Ben Chang and Barbara C. Scotto filed for re-election. Town Clerk Patrick J. Ward, Housing Authority board member Barbara B. Dugan, and Library Trustees Carol Axelrod, Vivien E. Goldman, Regina Healy and Carol Troyen Lohe are unopposed for re-election. Terms for Housing Authority are five years. Regular terms for other offices, not filling vacancies, are three years. Town meeting members: There will be more candidates than available town meeting seats in Precincts 1, 4, 5, 6, 7 and 12. The other ten precincts have what political wags sometimes call “beauty contests,” with five candidates for five seats providing three-year terms. Candidates vie to see who can get the most votes. Owing to resignations, there are one-year terms up for election in Precincts 4, 14 and 15–with one candidate filing in Precincts 4 and 15. No one filed for a one-year seat in Precinct 14. In Precinct 1, Peter J. Ames of Ivy St., an unsuccessful candidate in each town election from 2008 through 2014, is contesting with the five incumbent town meeting members: Cathleen C. Cavell, Elijah Ercolino, Neil R. Gordon, Carol B. Hillman and Sean M. Lynn-Jones. At Advisory Committee the evening of March 17, Mr. Lynn-Jones was elected chair. He replaces Harry K. Bohrs, from Precinct 3, who had recently resigned because of increased pressures of work at his law office. In Precinct 4, incumbent Edith R. Brickman chose not to run, while new candidates Jeremy Michael Shaw of Washington St. and Sarah T. Boehs of Aspinwall Ave. filed. In Precinct 5, retiring member of the Board of Selectmen Betsy DeWitt is contesting with the five incumbent town meeting members: Robert S. Daves, Betsy Shure Gross, Phyllis R. O’Leary, William E. Reyelt and Claire B. Stampfer. In Precinct 6, new candidate Daniel Saltzman of White Pl. is contesting with incumbents John Bassett, Christopher Dempsey, Virginia W. LaPlante, Ian Polumbaum and Robert I. Sperber. Dr. Sperber is a previous superintendent of Brookline public schools and founder of the Economic Development Advisory Board. This is a precinct noted for political activity and sometimes for sharp elbows. In Precinct 7, incumbent Sloan K. Sable chose not to run, while new candidates Susan Granoff of Vernon St., Keith A Duclos of Vernon St., Crystal A. Johnson of Harvard Ave. and Stacey Zelbow Provost of Washburn Pl. filed. In Precinct 12, A. Joseph Ross of Washington St., a former town meeting member in another precinct, is contesting with the five incumbents: Lee Cooke-Childs, Chad S. Ellis, Amy Hummel, Mark J. Lowenstein and Judy Meyers. A key element: One factor in the elections is likely to be candidates’ positions on May 5 ballot questions about a tax override and a debt exclusion, both intended mainly to benefit Brookline public schools. More than 80 percent of a $7.7 million permanent tax override is slated to be spent for schools. The proposed, temporary debt exclusion is to expand and renovate Devotion School, on Harvard St. near Coolidge Corner. This entry was posted in Elections, Grade schools, High school, Taxes on March 17, 2015 by Craig Bolon. A regular meeting of the School Committee on Thursday, March 12, started at 6:00 pm, held in the fifth-floor meeting room at Town Hall. The main event was the FY2016 budget proposal from William Lupini and Peter Rowe, the school superintendent and the deputy superintendent for administration, which had been delayed twice. Also on the original agenda for March 12, but postponed for a fourth time, was a review of school administration, coordinated by the Collins Center for Public Management, from the University of Massachusetts at Boston. Others on hand from the School Department for the budget review were Jennifer Fischer-Mueller, the deputy superintendent for teaching, and Mary Ellen Dunn, the incoming deputy superintendent for administration after Mr. Rowe retires at the end of June. School Committee members Benjamin Chang, the chair of the finance subcommittee, and Michael Glover, newly elected last spring, missed the meeting. Jessica Wender-Shubow, president of the Brookline Educators Union, was there. The Advisory Committee blanked the meeting, instead scheduling three subcommittee hearings and a full Advisory review of the police budget. It could easily have scheduled those for the previous evening, when there were no meetings at Town Hall. No member of the Board of Selectmen came, even though the board recently proposed a permanent, $7.665 million per year tax override, primarily to support the school budget. There were four members of the public, two of whom left midway through the budget presentations. One who stayed was Pamela Lodish, a former member of the School Committee and Advisory Committee who has taken out papers to run for a seat on the Board of Selectmen this spring, after announcing opposition to the tax override, along with a group of some well known residents. Two budgets: The school budget for the fiscal year starting next July is complicated. As Dr. Lupini explained, it is really two budgets: one to be followed if voters pass the proposed override and the other to be followed if they do not. Under the no-override budget, Mel Kleckner, the town administrator, has proposed $0.68 million in municipal service cutbacks, allocating the money saved to help schools cope with increasing enrollment. If the override passes, Dr. Lupini and Mr. Klecker have proposed to use only about $6.2 million of $7.7 million authorized during fiscal 2016, reducing the impact on taxes for that fiscal year. Dr. Lupini expressed concerns about state funding for education, saying Brookline now expects to lose about $0.25 million in support for full day kindergarten. He said Brookline stands at risk of higher increases in health-care costs than anticipated by current budget proposals. Of those amounts, only the $0.49 million for nurses and counselors was clearly associated with enrollment growth. That would add traditional school service staff Dr. Lupini says were needed but whom Public Schools of Brookline could not previously afford. The remainder of the added spending appears to create or substantially expand programs beyond traditional curriculum and beyond service levels currently offered. Dr. Lupini argued, for example, that “interventional” coaching has been overstressed as a result of enrollment growth. At the Thursday meeting, Dr. Fisher-Mueller, the deputy superintendent for teaching, argued that the leveling off of test scores seen in recent years reflects shortfalls in school services. However, she did not provide data to substantiate the claim. It was also not clear whether spending more money to raise test scores would prove consistent with Brookline’s community values. Unfortunately, it is impossible to investigate such claims with information readily available to the public. Unlike the municipal department budgets published on February 17 this year, Public Schools of Brookline has not published a timely and detailed annual financial plan describing a proposed budget, comparing it with past budgets and measuring spending amounts against documented performance factors and objectives. Public Schools of Brookline now labels the “gifted and talented” program as “enrichment and challenge support.” It is part of the “interventional” coaching that Dr. Lupini would like to expand with a tax override. Dr. Lupini had previously said that expansions to the elementary school world languages program would have to be ended if there were no override this year, but on Thursday he did not propose to do that. However, he said it would probably happen the following year. Those were implemented after voters approved the previous tax override in 2008. Sharp-eyed readers will surely notice that the sum of the extra spending proposed with an override and the cutbacks proposed without one, $4.06 plus $1.16 plus $0.68 million–or $5.9 million–is substantially less than the $6.2 million Dr. Lupini said would be used in FY2016 from a $7.7 million override. He did not explain the discrepancy. Budget review: At first, School Committee members hesitated with questions. After the meeting, Mr. Rowe mentioned that they had received copies of the budget message by e-mail only that afternoon. Committee member Lisa Jackson wanted to know what would happen in the next two years without an override. Dr. Lupini said there were likely to be more cutbacks and larger class sizes. With or without an override, Dr. Lupini proposed to spend $0.59 million more in the next fiscal year on elementary school teachers and support staff, to address rising enrollment, and to spend $0.50 million more on administration and support for Devotion School during construction, while students are divided among two or more sites. One might expect that any such extra spending for Devotion School would end when the new school opens, but Dr. Lupini did not say. This entry was posted in Elections, Grade schools, High school, History, Meetings, Services, Taxes on March 13, 2015 by Craig Bolon. With the initial release of federal energy data for 2014, we can see a year of gradual progress. Total U.S. energy use rose slightly, but without signs of resuming the long-term growth that appears to have peaked around 2005. The sharp drop in coal burning and sharp rise in gas burning during 2012 evened out. Coal use remained in long-term decline, an average reduction of 3.4 percent per year between 2008 and 2014. Natural gas use remained in long-term growth, an average increase of 4.5 percent per year over the same span of years. Renewable energy production remained stable, a plateau that began during 2011. Net U.S. energy imports continued to fall rapidly, reaching the lowest levels since the mid-1990s, mainly because new domestic oil and gas from shale formations continued to displace imports. If the trend since 2005 were to continue, The United States would become energy-sufficient during 2018. However, averaged over the year, U.S. retail gasoline prices remained at inflation-adjusted highs, near peaks of the early 1980s–leading to rapid price declines in the last few months of the year as reactions to excess production. Electricity generation: In recent years, electricity generation has become a dynamic U.S. energy sector with changes in energy sources, including the growth of renewables. Although promises during the late 1990s of nuclear power at much lower cost proved wildly optimistic, nuclear power remained a stable subsector. Capacity lost from five U.S. plant closures announced during 2014 will be replaced by four new plants to open during 2017 through 2019. The third-generation AP-1000 reactor design from Westinghouse and Toshiba is becoming a world standard. All four U.S. and all four Chinese third-generation nuclear units now under construction use that design. The major trends since 2005 have continued through 2014: replacement of coal-fired electricity with natural gas-fired electricity and electricity from renewable sources. Among the latter, federal agencies track wind, solar, biomass and geothermal. They count burning municipal waste for energy among many “other” sources of electricity generation. Nuclear power, hydropower and petroleum-fired power remained fairly stable at about 19, 6 and 1 percent of generation, respectively. Between 2004 and 2014, natural gas-fired power grew from 18 to 27 percent of U.S. electricity, and all that EIA counts as renewable generation combined grew from 2 to 7 percent. New England has often been ahead of most of the U.S. in adopting new energy sources for electricity. Recently, however, New England has been falling in electricity generation using natural gas and resorting to electricity imports from Canada and New York instead of generating its own power. Renewable generation: Compared with the rest of the U.S., New England developed a peculiar approach to renewable generation. A majority of U.S. renewable generation, about 7 percent of the electricity supply, now comes from wind turbines, and most of the rest comes from solar. According to EIA, New England got only 1.6 percent of its 2014 electricity generation from wind and 0.4 percent from solar. It outperformed the U.S. in renewable generation by burning wood and municipal waste. Natural gas in New England: Over the last 20 years, New England has replaced nearly all its coal-fired generation capacity with high-efficiency, combined-cycle natural gas-fired plants. Natural gas use for electricity generation has been crimped since 2013 by pipeline transmission limits. The new, low-pollution plants have often been idled for lack of gas supplies. Only two major domestic gas transmission pipelines–the 1949 Algonquin and the 1992 Iroquois–cross the Hudson River. Lack of transmission pipeline capacity has cut off New England from plentiful, low-cost domestic gas supplies. During 2014, about 2 GW of New England’s gas-fired generating capacity was outfitted to burn fuel oil, even though oil costs more and pollutes more than gas. This entry was posted in Business, Environment, History on March 10, 2015 by Craig Bolon. Since the first of four large snow storms during the 2015 winter, Public Works has been actively removing snow, first in commercial areas, then along major streets and later along some of the narrower and more heavily used residential streets. Early in the morning of Monday, March 9, a crew came to work on blocks of Fuller St. between Harvard St. and Commonwealth Ave.
Equipment: The key equipment for snow removal is industrial snow blowers, much larger and more powerful than those sold for home and commercial use. Brookline has been using models D65 and D60 from JA Larue of Quebec. They clear paths about 9 ft wide through snow banks up to about 4 ft and 6 ft high, respectively, powered by 200 to 400 hp diesel engines. The blowers have been mounted on 4-wheel front-loaders from Volvo Construction Equipment, of about the L120 class, with tires over 4 ft in diameter. Large 10-wheel and 14-wheel dump trucks, with capacities about 10 to 16 cu yd, move along with the blowers, catch snow and cart it to disposal sites. Brookline has been storing snow near the waste transfer station off Newton St. and in some of the larger parks, including Emerson Garden. Cost and productivity: On Fuller St., staffed with one blower, five trucks and a supervisor, the crew took about an hour to clear a 4 to 5-ft wide snow berm on the northeast side, 3 to 6 ft high, from the 800-ft block between Gibbs and Clarence Sts. At a nominal $150 per hour for each item of major equipment, that operation might have cost about $1,000–around $6,000 per mile. Productivity was reduced by waiting for trucks, with the blower left idle about half the time. However, cost per mile was dominated by trucking and could not have been reduced by much. The supervisor and two of the trucks were Brookline-marked vehicles. The other trucks and possibly the blower were from D’Allessandro of Avon, the main contractor for snow clearance during the winter of 2015. At a meeting of the Board of Selectmen Tuesday, March 10, Public Works is seeking a $1.5 million increase in the D’Allessandro contract. If board members are on their toes, we can expect to hear how much Brookline has spent for the season. The reported season snow total of 8-1/2 feet, so far, is way beyond the 3-1/2 feet of snow assumed for this year’s budget, and the snowfall concentration over less than three weeks, early in the season, led to much more snow removal than usual. This entry was posted in Neighborhoods, Services on March 9, 2015 by Craig Bolon. Hancock Village lawsuit: As reported in the Brookline Beacon, the Board of Selectmen have an aggressive lawsuit in progress opposing a large, partly subsidized housing project proposed for Hancock Village in south Brookline. As part of this effort, they have been working with a group of south Brookline neighbors. The property owner and manager, Chestnut Hill Realty, has been trying to use powers under Chapter 40B of Massachusetts general laws to override Brookline zoning and has been trying to bypass a 1946 zoning agreement with Brookline. Brookline, like most other Massachusetts towns, does not maintain legal expertise in the specialized area of Chapter 40B projects. The Board of Selectmen is considering “hiring outside counsel to pursue the appeal.” According to south Brookline participants, Jason Talerman of Blatman, Bobrowski & Mead has made contributions to the current lawsuit opposing the project, known as Brookline v. Mass. Development, which is pending in the Massachusetts Court of Appeals. Contracts, personnel and finances: Joslin Murphy, the town counsel, got approval to transfer $0.08 million from salaries to contractual services. Her office has an unfilled position and has been employing “outside counsel” on several cases since July. During a budget review, Ms. Murphy said she was confident about being able to hire a “talented attorney” into a T-15 slot, but she has already gone eight months without hiring anyone. Melissa Goff, who recently advanced to the job of deputy town administrator, reviewed the budget for the offices of town administrator and board of selectmen. There is little change from the current year. Mel Kleckner, the town administrator, would like to spend an extra $0.01 million to join an association of Massachusetts mayors, even though he is not a mayor. He won’t spend it unless Brookline voters pass a tax override this May. This entry was posted in Development, Elections, Events, History, Housing, Meetings, Neighborhoods, Services, Taxes on March 4, 2015 by Craig Bolon.